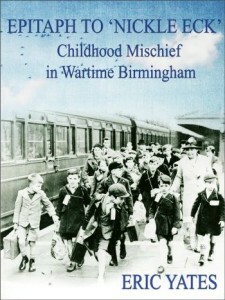 The following is a guest post by the publisher of Eric Yates, author of Childhood Mischief in Wartime Birmingham. If you would like to write a guest post on my blog, please send me an e-mail at contact@cecilesune.com. This treasure trove of Second World War stories are a must read for those wanting to know about the lives of ordinary families in the history of Britain – or indeed, anybody wanting a good laugh to brighten up their day. In the history of Britain there is a shortage of Second World War stories detailing the lives of ordinary families living in poverty, the children’s games and the black market profiteering that history has forgotten. Rationing worked splendidly if the families of a working class council estate understood the basic premise, which was flawed. Bread was not rationed and few families could eat all the bread allowed, but distribution was restricted to only one daily delivery and Mom made sure our family was always at the front of the queue. Therefore, if a family needed extra bread we, the Yates’s, honed in on them and began to barter. Mom found that a local family, named Jebb, were supreme champions at eking out the meagre tea ration – which was based on the little-understood fact that very little tea was grown in England, especially in Birmingham. Eric did two years' National Service as an Army Education Officer in Cyprus, and seven years with the Kenyan Police in East Africa where, as a Customs & Excise Investigation Officer, he swam in shark-infested waters looking for hidden contraband. Whilst living in Africa, he joined the National Theatre of Nairobi where he performed in Shakespeare, the Classics and drama.